These are the perfect back to school, work or college bars to help get you through the end of summer slump. 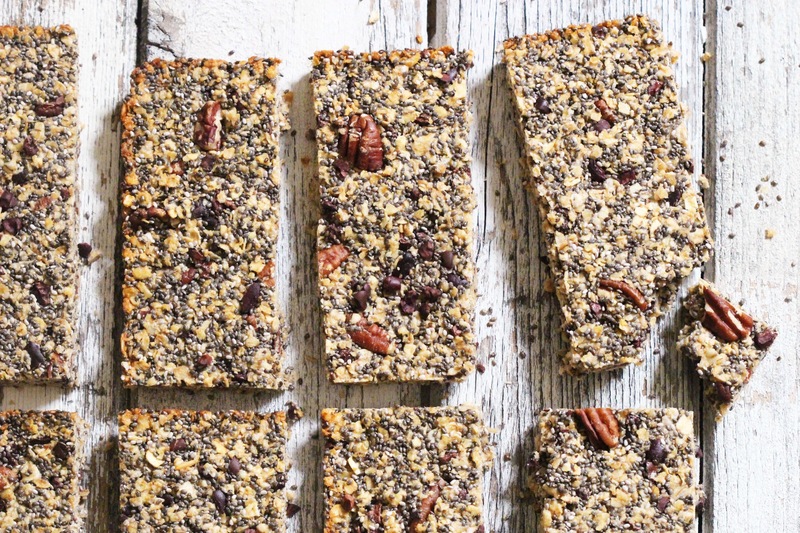 There’s less than a teaspoon of honey in each bar but they still taste gorgeously sweet and the cashew butter and chia seeds give them an amazing crumbly chewiness as well as huge boost of omega 3’s. 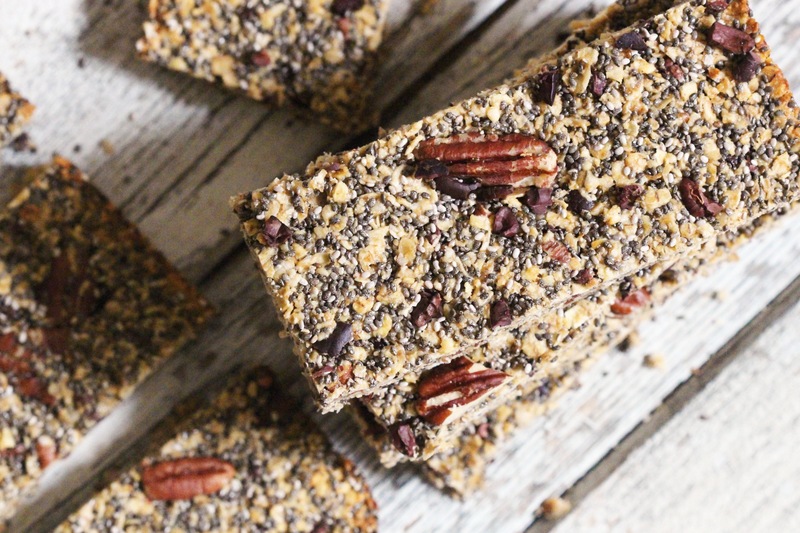 The cacao nibs are the best part, so do use them over dark chocolate if you can, they’re an amazing source of antioxidants and flavonoids as well as magnesium and potassium and they’re sharp richness is so perfect with this combination. 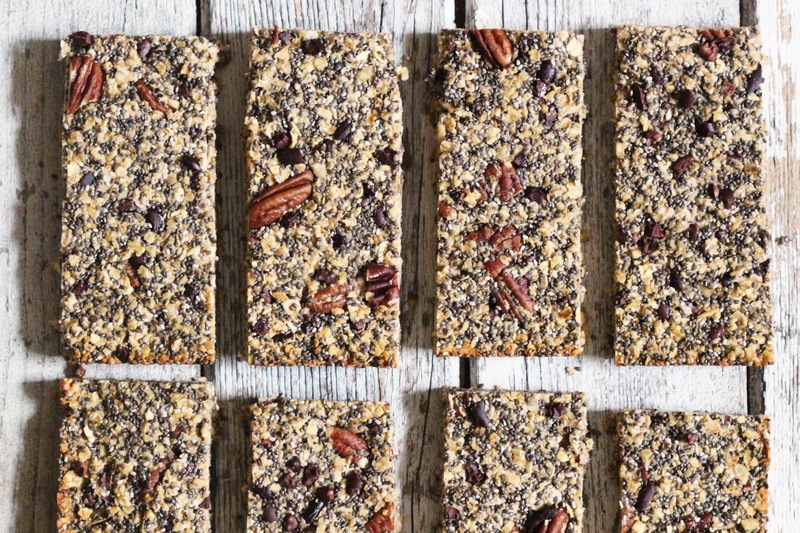 These are the best energy boosting bars full of fibre, healthy fats and loads of other nutritious goodies. Preheat the oven to 180’C. In a large bowl, combine the oats, chia seeds, pecans, cacao nibs and a pinch of coarse salt. Mix well. In a small saucepan over medium heat, whisk together the cashew butter, honey and 3 tablespoons of water. Whisk until smooth. Mix the cashew mixture into the dry ingredients until well combined. Line a baking tray with parchment paper and press the mixture very tightly into the tin. Bake at 180’C for 12-15 minutes until golden. Leave to cool and then slice.